﻿The theme of this year’s HALS challenge is to document historic landscapes that reflect the heritage of women. The purpose of this year’s challenge is to increase awareness of the role of women in shaping the American landscape. The idea started four years ago, when the Northern California Chapter of HALS challenged the rest of the nation, to prepare a HALS short form for a children’s theme park. We got the idea when Jennifer Liw, a PGAdesign employee wrote up a form for Fairyland in Oakland’s Lakeside Park. Narrow foundation planting beds surround the home and appear much as they did in 1915. The site is surrounded by a mixture of endemic and imported ornamental trees, as it was in Ellen White’s time. There are remnants of fruit trees and a small vineyard surrounding the structures. 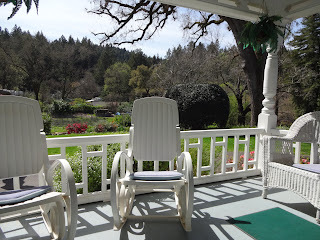 At its peak the property had 2000 plum trees, 5 acres of grapes, 5 acres of olive trees, and several peach trees. The household grew and processed the fruit and olives for their use and they supplied the nearby Rural Health Retreat and sold their products through the Home Fruit Company. This site has so many stories to tell – it is fascinating. 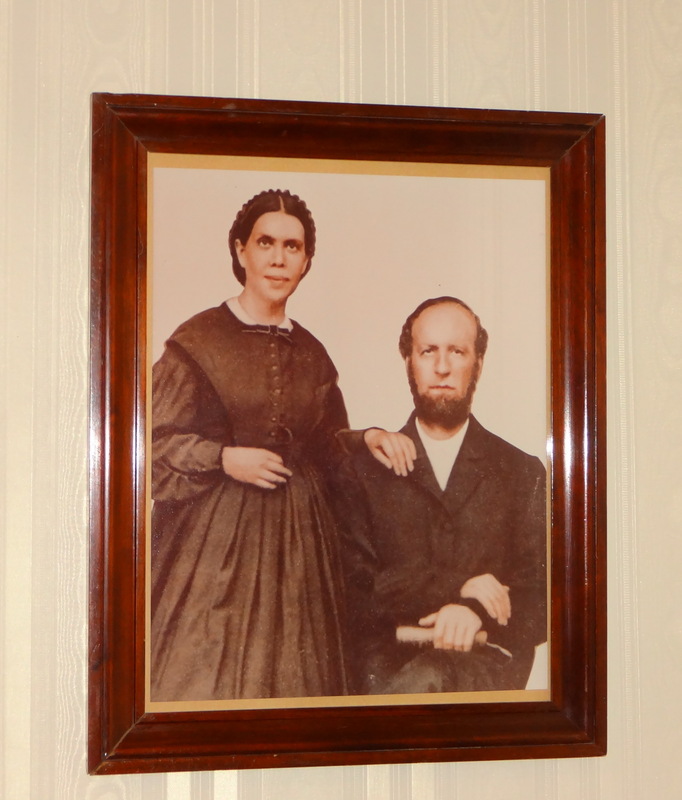 I am astounded that I’d never heard of Ellen G. White and knew nothing about her. It is well worth a day trip any time of year and a picnic lunch or stop at one of Napa Valley’s many wineries. We enjoyed a fabulous lunch at Mustard’s Grill in Yountville. A couple months ago I drove to Martinez to help celebrate a house warming hosted by my cousin’s daughter. 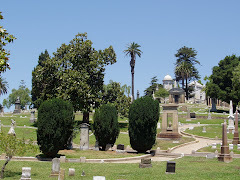 I drove from Oakland, through the Caldecott Tunnel and took the Pleasant Hill exit onto Taylor, then Alhambra Avenue, and was surprised by what a beautiful drive it was. I feel like I know all the Bay Area roads but somehow this route was unfamiliar and a delightful discovery. 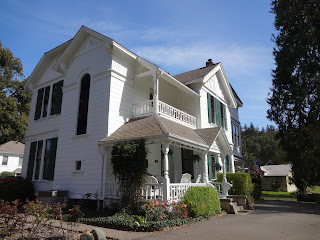 On the way we passed the John Muir Home site in Martinez, which I’d visited before but had not been to for many years, so the following day I drove back to Martinez but this time to visit the John Muir National Historic Site – California Landmark No. 312. It is also a National Historic Landmark and on the National Register of Historic Places. Like so many historic properties what remains of the 2600 acres of land originally owned by Muir has been carved away by urban intrusion. What remains is enough to interpret the site and tell the story of what it had been like historically. A train trestle that can be seen in historic photos is still there and helps create a gateway into town. Forested surrounding hills offer views from the Muir home that are probably much the same as those viewed by Muir and his family while resident at the site. ﻿ From a small parking area one enters the property through a visitor center. Muir is known for many things – a founder of the Sierra Club, a naturalist, someone who helped convince President Teddy Roosevelt to make Yosemite a national park, and a writer. This site tells the story of each of those roles but focuses primarily on Muir as a husband, family man and on his interest in growing trees and vineyards. A walking path leads from the visitor center to the Muir/Strentzel Home originally built in 1823 by Dr. John Strentzel, father-in-law of John Muir. The house is filled with memorabilia from the Strentzel and Muir families. Exiting the house paths lead to the carriage house, a picturesque windmill and on to the Martinez Adobe – another California landmark on the same property. A variety of fruit trees are planted in orchard rows - cherries, apricots, figs, citrus, olive and quince. There is also a small vineyard (Zinfandel, Tokay and Muscat grapes) near the carriage house which in September bore sweet, ripe grapes nearly ready to pick. Part of the park service program includes harvesting and processing fruit produced on the land. A ranger shared a story about a regular park supporter who makes jelly rolls from the quince that ripens in October. Out towards the adobe two gigantic pecan trees caste broad shade over a few picnic tables. ﻿ In addition to fruit trees there are good examples of a large variety of mature ornamental trees. Most notable are two gangly Mexican fan palms (Washingtonia robusta) that rise above the house at either side of the front steps. 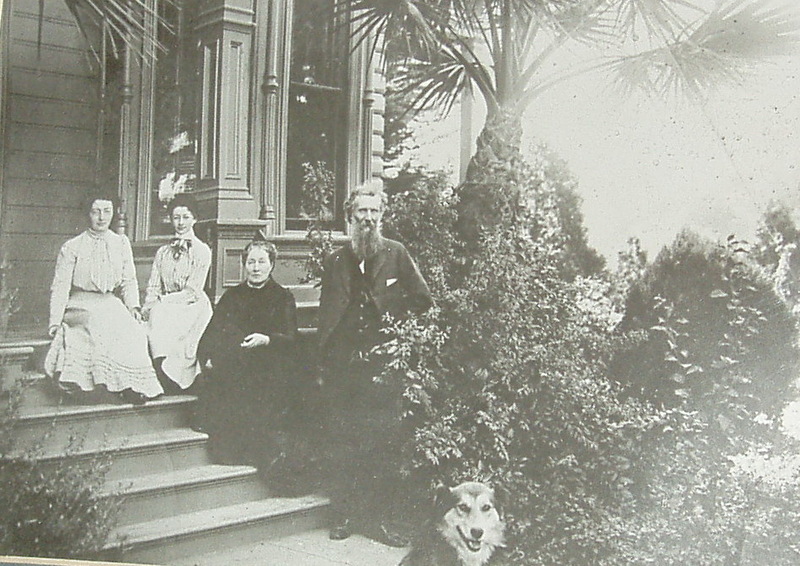 Inside the house you’ll see these same two palms appearing in photos – one with the Muir family sitting on the front steps and their dog “Stickeen” - when the trees are only about 10 feet tall. One side of the house is encircled by a row of incense cedars (Calocedrus decurrans). There are sculptural deodar cedars (Cedrus deodara), a specimen giant sequoia (Sequoiadendron giganteum), redwoods (Sequoia sempervirens), California Fan Palm (Washingtonia filifera) and a date palm (Phoenix canariensis) with a very rare, curving trunk. The small town of Martinez has a lot of nice older homes and some of the downtown streets have been redesigned to incorporate outdoor café spaces. 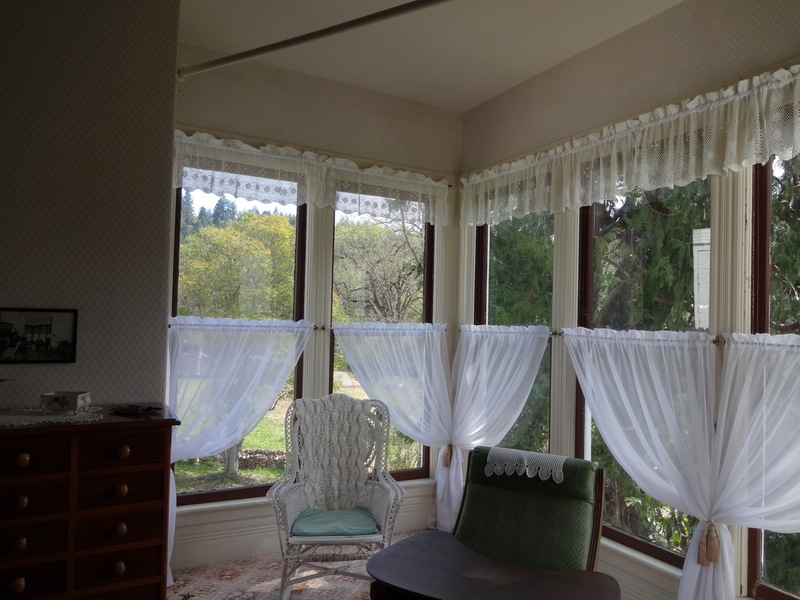 Check it out next time you are exploring in the North Bay Area. Last Sunday was a beautiful day in the Bay Area so we decided to take another HALS day trip. 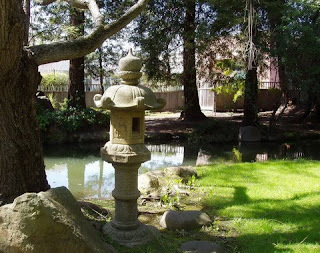 I pulled out my list of historic sites for Alameda County and decided to visit the Shibata Garden - a privately owned Japanese style garden in Hayward. Since I’m working on the Sakai and Oishi Nurseries, I thought it would be interesting to see how the Shibata Garden compared. We used our TomTom navigation system to find the site and when we arrived were puzzled to find a relatively new business park – no trace of a historic nursery or garden, but we weren’t going to give up yet. We drove into the business park and found a sign for the Shibata Garden. Driving to the back corner of the parking lot, wedged between the business park and freeway off ramp, we found the garden. 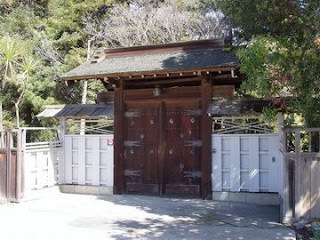 I parked the car in the shade, for the benefit of our two yellow labs, and headed for an elaborately detailed, traditional Japanese wooden gate into the garden. Once inside the gate the architecture of the big box business park buildings was screened by evergreen and coniferous trees – mostly Redwoods/Sequoia sempervirens, Casurina, Magnolia and a variety of pines. The path here is pea gravel, there are several large, sculptural boulders (4-6’ in dimension), and the first of several stone pagodas found in the garden, each about 4 feet in height. Offset by a jog is a curved wooden bridge that rises up as it traverses a curvilinear shaped pond that is lined with stones of varying sizes. The bridge railing is wood with simple detailing and a 2x6 cap, painted red. At the far end of the, bridge there is a concrete and stone patio that widens out to about 10’ x 12’. 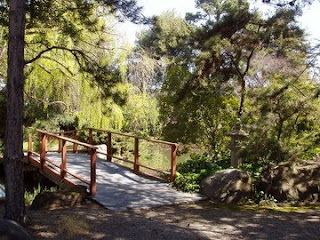 One section of the pond edge is defined by wood logs set on end – these jut in and out to form a strong serpentine line. From the bridge walking left, on a three foot wide concrete and stone path, leads to an elaborately detailed entrance to the residence. There is lawn at either side of the path, a sculpted pine, and a low, busy palm to the right of the door. There is a large Sycamore tree at the corner of the house and beyond that a small brick and glass greenhouse with a U-shaped workbench inside. At the rear of the house there is a small nicely detailed structure (about 10’ x 15’) made of concrete block, glass block and wood. One can see Japanese joints in the roof structure. The building is used to store tools and garden supplies. A line of Casurina trees provides screening inside the fence and an impressive line of timber bamboo is behind the house. Walking around the back of the residence there is a dense planting of a smaller, much more closely spaced bamboo at the side of the house that creates a dense, visual screen. At the front of the residence there is a brick patio with a stone fireplace and wood shade structure approximately 16’ x 32’. A brick path, 3 feet wide, leads to a door to the house and two wide steps lead back to the pond. The brick patio, fireplace and shade structure appear to have been constructed in the 1950s. Between the brick patio and the pond there is a stone path consisting of flat stones – 8” – 12” in diameter, three across forming a path 30” wide. The path curves to the right and terminates with a boulder at the residence. To the left, the path transitions to flat, flagstones set in dirt and the edge of the path is defined by pieces of 3”x6” wood members set on end 5” high. The wood pieces are offset from each other to form a zigzag pattern. As you walk around this path, that encircles the pond, the wood members on the left side change to a rock wall 12” to 20” high. At the far end of the pond, furthest from the house a grouping of large boulders are set on end and are set back from the edge of the pond. This appears to have been the source of water for the pond. Originally there was very likely a small waterfall here. 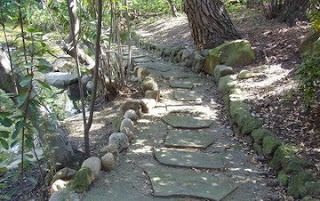 A line of rounded boulders, along the path route, are placed so one can step over the water that would have flowed from the falls to the pond. This spot is the focal point of the primary view from the residence and is accented by the waterfall, a mature Japanese Maple to the left and a Cherry Tree in the background. The pond with its reflecting surface and floating water lilies are in the foreground. During World War II the Shibata family was interned at Tule Lake. After the war they went to Chicago, Illinois and then returned to their home at Mt. Eden. At one point the nursery included 34 greenhouses, a boiler house, and a packing house in addition to the residence. The Online Archive of the Bancroft Library, University of California, Berkeley, has a black and white photograph of Jinjiro and Yoshima Shibata inside one of their greenhouses, taken in June of 1945. The garden is owned and maintained by the Business park and is available to their tenants; otherwise it is a private garden and not open to the public. 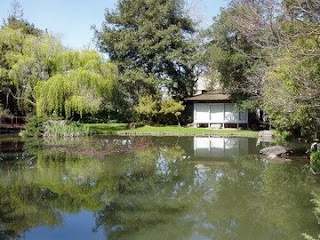 It is a good example of a traditional Japanese garden. ﻿In January of 2010 I wrote about China Camp State Historic Park in San Rafael. It is one of the 70 California Parks that was threatened with closure but thanks to the Friends of China Camp and others this unique cultural landscape will remain open ….. for now anyway. A few months ago the Northern California chapter of HALS selected China Camp as our 2012 project. Ellen Joslin Johnck volunteered to lead an effort to prepare a set of standard HALS documents – that involves completing three elements: a written historic narrative, measured drawings and HALS quality photographs. Saturday morning a group of HALS members met at the cove where years ago Chinese immigrants ran a successful shrimp harvesting business until they were driven out by discriminatory laws aimed at destroying the thriving business. Frank Quan and Steve Deering. ﻿ We could not have hoped for a more perfect day on the bay. It was warm but not hot and not windy. The air clear and the colors of the water, the hills in the distance, and the trees, growing on the steep slope that protects the cove, were rich and vibrant. Near the end of the day I was looking up that slope and was awestruck by a massive 10 trunk California Bay Tree with a broadly arching canopy. As we were planning for the day I thought there wasn’t much there and it might take a couple of hours to get the job done, but by noon we were ready for a lunch break - we had made a good start but were far from being finished collecting and recording the existing conditions. My group started by locating one side of the foundation of one of the “lost” buildings. Cathy Garrett and Jennifer figured out the purpose for and route of two sets of train tracks that were used to move shrimp off the boats and into a long, narrow brick building where the shrimp were dried, and the third group were most intrigued by an overgrown set of stone steps that ascend the slope. During lunch we were very fortunate to get to see the Grace Quan, an authentic replica of a Chinese junk, sail into the cove from the east. This reconstructed ship was built at China Cove under the direction of John Muir a curator and boat-builder at the San Francisco Maritime National Historical Park. The junk is completely black – the hull and broad mast and stood out prominently in San Pablo Bay. HALS members Jennifer, Braan Collett and Janet. By 3:00 we finished measuring and drawing the details of what remains of China Camp – a collection of artifacts and a living history museum. Throughout the day we were joined by many park visitors who came to explore this uncommon cultural resource, to picnic and relax on the beach. It was a perfect day at China Camp – a day that demonstrated why our state parks are treasured and why we must find a permanent solution that will keep these places open now and for future generations. ﻿The 2012 national HALS Challenge is to document an American Latino landscape. At a recent Northern California Chapter HALS meeting the idea to record each of California’s missions was adopted. I created a flyer to announce the challenge and have been leading the group’s effort to organize volunteers who will prepare a HALS short forms for each of the 21 sites. So far 19 missions have been adopted. Initially I prepared a form for the Carmel Mission – see my blog post from August 2010 - and used it as an example. Last month I visited Mission San Jose with my 4th grade grandson and together we observed, photographed and took field notes for that site. Mission San Jose was founded on June 11, 1797 by Father Fermin Francisco de Lasuen. It was the fourteenth of California’s twenty-one missions and the first of five missions Father Lasuen planned to fill in the gaps between the original thirteen missions. The Mission was known for its production of olive oil and for its Native American musicians – a band and choir taught by Father Narciso Duran. In May 1827 when Jedediah Strong Smith spent time at the mission he noted that the band had “12 or 15 violins, 5 base vials and one flute.” During the 1830’s and 1840’s Mission San Jose functioned as the social center for the ranchos on the east side of San Francisco Bay. The original church building was completed in September of 1797 and expanded in 1798. That building was replaced by a larger adobe church in 1809. Other buildings in the quadrangle housed the padres, a granary, schoolrooms, workshops, dwellings for converts, barracks for soldiers, guestrooms, storage areas and a gristmill on Mission Creek. At its peak there were more than 100 buildings in the complex. The 1809 edifice stood until it was destroyed in an earthquake on October 21, 1868. In 1869 the adobe church was replaced by a wooden gothic-style church built over the original foundation. That building was moved to the City of Burlingame in 1982 and an authentic replica of the 1809 adobe church was reconstructed and completed in 1985. 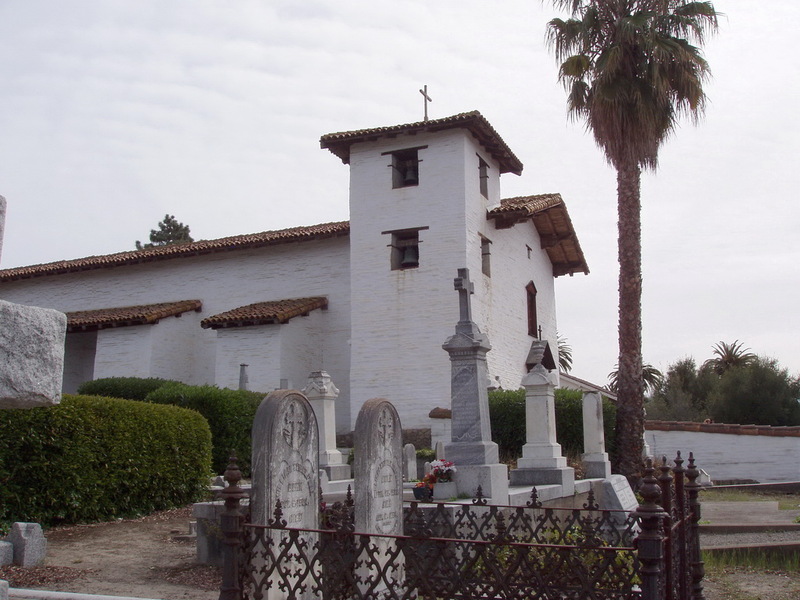 ﻿ Mission San Jose was the second to last to be secularized in 1836 and Jose de Jesus Vallejo was placed in charge. For a short time portions of the mission were used by renters and squatters. During the California Gold Rush it served as a trading post run by Henry C. Smith, a member of General Fremont’s California Battalion. In the 1860s a tavern and hotel occupied space at the mission. Today the mission church is part of St. Joseph’s Parish in Fremont, and is part of the Diocese of Oakland. Mission San Jose is California State Landmark No. 334, and listed on the National Register of Historic Places. Studying the missions is something every 4th grade student does in California. If you didn’t attend elementary school in California you should make a point of visiting one or several missions to get a unique view of the state’s history. Even if you did attend school in California it may be time to go back and refresh your knowledge of our state’s beginnings. ﻿ For anyone who ever thought history was dull how is this for a headline: “How Two Beauties Are Spending “King Kohl’s” Hoodooed Millions - Plutocrat’s Suicide with his Widow Engaged to a Count and His Heart Mate Leasing A Mansion in Paris”? I found this story complete with provocative sketches while researching the Kohl Mansion in Burlingame for the Historic American Landscapes Survey (HALS). It was published by the Port Arthur News on November 4, 1925. 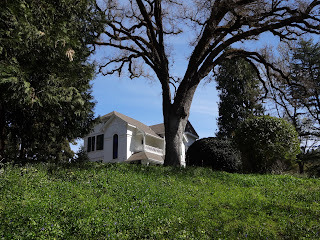 Three weeks ago my partner, pups and I set off on another HALS adventure and discovered the Kohl Mansion also known as “The Oaks” because the 40-acre property is covered with many old live oak trees. It is a beautiful campus now occupied by the Sisters of Mercy High School. The Kohl Mansion was built for Charles Frederick “Freddie” Kohl and his wife Mary Elizabeth “Bessie” Godley. The 53-room Tudor- style brick structure was designed by architects George Howard and John White of Hillsborough and was planned to closely resemble Somerset House, the residence of the Duke of Surrey in England. Frederick Kohl was born in 1863, the son of William H. Kohl who was a pioneer ship builder and co-founder of the Alaska Commercial Company. Kohl was one of the richest men in the San Francisco “Gold Belt”. In addition to the Burlingame estate Kohl owned property in downtown San Mateo that is now Central Park, the Kohl office building in downtown San Francisco and a “castle” at California’s Lake Tahoe. He married Ms. Godley in 1904 and acquired the 40-acre Burlingame property in order to build a home where they could entertain and where Bessie, who had a beautiful contralto voice, could perform for their guests. In 1916 Bessie left Frederick for Europe and never returned. For a time Frederick lived at the St. Fransis Hotel in San Francisco. He began a relationship with Marion Louderback Lord and left her the bulk of his $5 million estate when died by suicide November 23, 1921. Mss Lord sold the property to The Sisters of Mercy who initially used the mansion as a convent then converted it to Mercy High School for girls in 1931, which is the current use of the property. ﻿ In 1921 the Kohl Mansion was leased to United Artists and the movie “Little Lord Fauntleroy” was filmed in the house. In 1996, “Flubber” starring Robin Williams was filmed there. The article in the Port Arthur News referred to the Kohl Mansion as “the greatest palace ever built in the West.” The grand terrace on the south side of the house extends the full width of the mansion and measures 215’ by 50 – 85’. A wall at the perimeter of the terrace is concrete with a concrete cap. It was built to emulate a massive stone wall. Weathering and the presence of lichen enhance the finish and increase the illusion that it is a stone wall. South of the terrace a lawn extends beyond the width of the terrace and is 295’ wide and 87’ deep. The east edge of the lawn has a planting bed that includes three historic lemon trees and a border of new, white shrub roses. Mature evergreen live oaks / Quercus agrifolia and coniferous trees including Deodar cedar / Cedrus deodara and blue atlas cedar /Cedrus atlantica `glauca’ fill the space beyond the south edge of the lawn. Much of the original sunken rose garden is present. It is set 5’ lower than the terrace and consists of brick paths set in a basket weave pattern, and small rose beds bordered with sheared boxwood hedges. Overall the rose garden measures 48’ by 54’ and is made up of 25 rose beds in a symmetrical pattern of round and rectangular beds. Two sets of brick steps with wing walls lead down into the rose garden from the south side. The surface between the rose garden and the terrace is pea gravel. Foundation plantings all appear to be new with the exception of a few hybrid roses with gnarled trunks. A 1916 photograph of the mansion shows only low boxwood hedges at foundations. There are also two sculpted boxwood hedges in the shape of a script “E” and two boxwood plants trimmed into three-sided pyramids. Overall the integrity of the garden is good. The Mercy High School campus occupies similar size acreage as the original Kohl property. Changes to the grounds necessitated by the change in use are obvious but generally have been handled appropriately. Where original historic fabric was too deteriorated to be retained replacements have been executed in a sensitive manner and in such a way that the viewer can easily understand what is original. The Kohl Mansion was listed on the National Register of Historic Places in 1982 No. 2750. The Sisters of Mercy was founded in 1831 by Catherine McAuley, a wealthy Irish heiress, who wanted to care for poor women and children in Ireland. The sisters arrived in San Francisco prior to 1855 and established St. Mary’s Hospital, retirement facilities and four schools in San Francisco and Oakland. They purchased the Kohl Mansion in 1924 and used it as the Motherhouse for the region. By 1952 they ran a high school in San Francisco and 25 elementary schools throughout California. In 1989 they became co-sponsors of Mercy Housing, Inc. Their mission is to provide quality, affordable, housing for the poor, to strengthen families, and to promote healthy communities. Today was a nice fall day, so a HALS adventure was in order, but with other things to do I wanted to visit a nearby site. Deciding on some place in Berkeley I reviewed the list of possible places and was struck by a listing for People’s Park. Initially I wondered why someone had included it in a list of potential HALS sites in Alameda County. It is certainly not historic – the database noted a construction date of 1969. On the other hand it certainly qualifies as a cultural landscape, and since my hometown of Oakland has gained international recognition during the Occupy movement maybe this is a timely topic. People’s Park is a lasting monument to the Free Speech movement that began in the late 60s and continued through much of the 70s while I was a student on the Berkeley campus. Walking around and through the park one sees many signs reminiscent of today’s protests. One also sees many elements comparable to any other community park – an expanse of lawn, a variety of trees and plants, a community garden, a stage, a restroom building, picnic tables, art and even a tot lot. Though this is a park conceived and constructed by volunteers – some who considered themselves anarchists - its design is remarkably similar to other parks - conventional. It occupies about two-thirds of a city block, has paths that enter the park from each corner and side, and has signage, lighting, and trash containers. There are areas shaded by mature canopy trees and a large, open, grassy area in the center where a group had erected canopies for an event and a blow-up toy for kids. UC students were attending the event while street people relaxed in their low-profile but very obvious encampments. 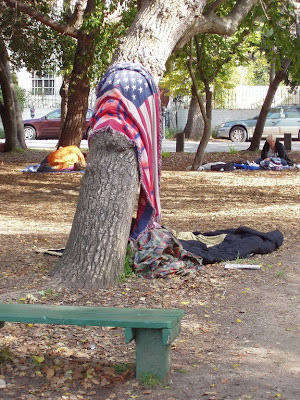 Our public open spaces – both designed and vernacular – often provide the venue for public discourse. We landscape architects design these spaces to encourage quiet conversation between two friends or massive public gatherings to voice our angst. Frank Ogawa Plaza, named after a long serving City Council representative, and where Occupy Oakland is based includes a large amphitheater and stage and the Jack London Oak – the symbol of our city anchors the park. This great tree and plaza serve as the forecourt to City Hall, the center of our government.